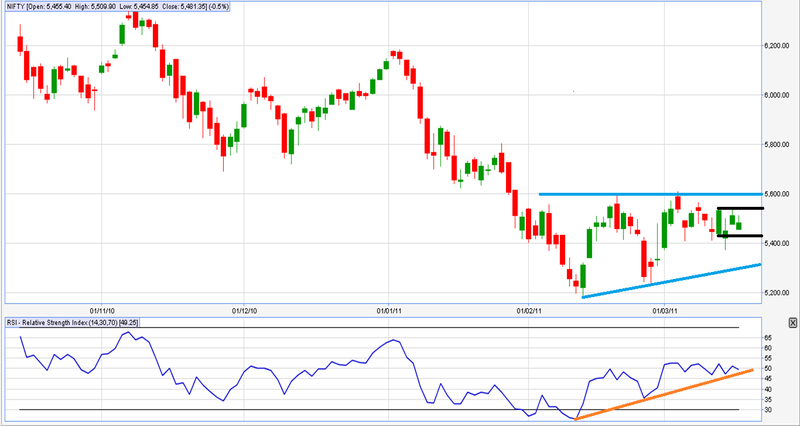 Nifty has been moving forth and back within a range for the past few sessions; giving no clear cues about the future price action. Mr.Market always love to push prices into no man's land, leaving all bulls and bears in dilemma. Now the price action for the past few sessions have given us an important cue about the major price action to begin. The range in between 5538 and 5434 is critical. I personally believe a close above or below this range would decide the next major movement in Nifty. Am watching these levels very closely. Will keep you updated once this range is breached. Apologies for not updating for the previous session and this morning; as I was held up in Bangalore. Keep watching this space for updates.